One of the biggest problems with doing this cookbook challenge is that if I make something like cookies or cake, Chris and I end up eating way too much of it. So, whenever I can find a reason to make something that can be shared with a larger group of people, I go for it. In week 38, we were going to a party at a friend's house, so I decided it was the perfect opportunity to make something to bring. I decided on caramel chocolate chip cookies from "The General Foods Kitchens Cookbook", by The Women of General Foods Kitchens, published in 1959. This book is heavily decorated with photos by George Lazarnick and Drawings by Mary Ronin. At first glance this recipe appears to be a standard chocolate chip cookie recipe, but there are some differences. Unlike other chocolate chip cookies I've made, this one calls for milk and brown sugar only, not white. It also calls for both baking powder and baking soda, which is a bit unusual. 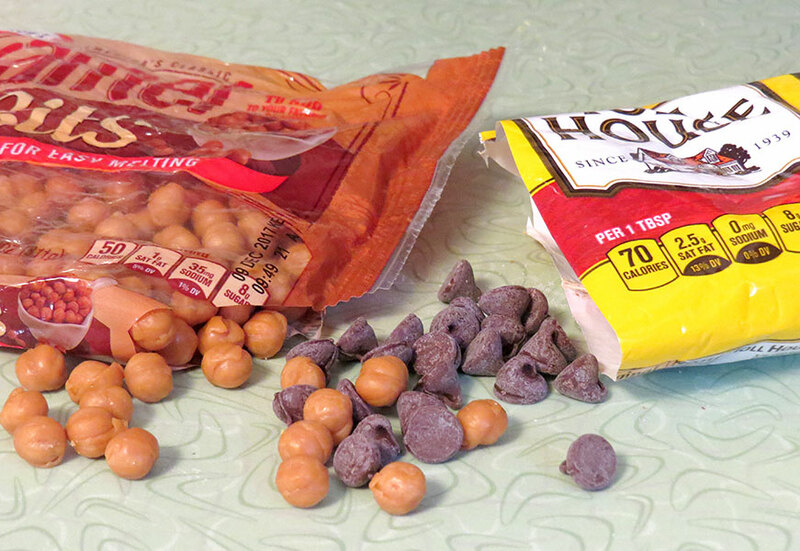 In addition to the chocolate chips, this recipe also called for caramel chips. Now, I'm not sure what caramel chips where in 1959. I was expecting something similar to butterscotch chips, but caramel flavored. When I went to the store, however, the only thing that they had was caramel bits, which are small balls of caramel meant to be used to melt down for things like caramel apples. Caramel bits and chocolate chips. I'm not going to lie, these caramel chips are addictive! The cookies were made like any drop cookies. 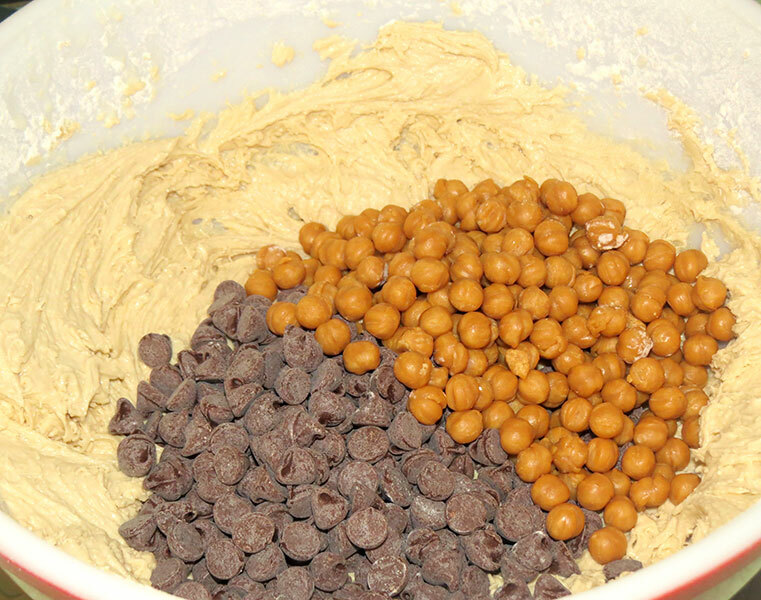 Since the recipe called for 1 cup each of chocolate chips and caramel chips, the dough was absolutely packed full. Piles of chocolate chips and caramel bits. 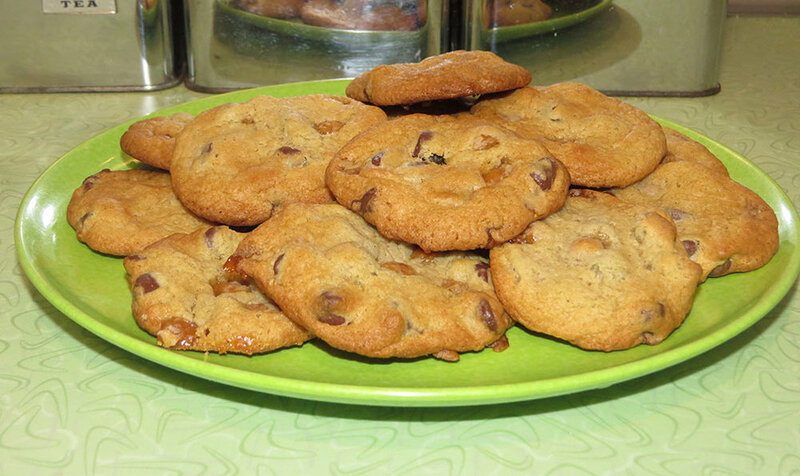 The final cookies tasted great, with soft chewy centers and crispy edges. The only problem was that the caramel bits melted and became quite gooey. As a result, the cookies were extremely chewy and you were in danger of possibly pulling a filling. They did soften up over the course of a few days and the caramel became a bit easier to eat, but I'm not sure if the caramel bits were the best addition to the cookies. I think a possible option for getting the caramel taste, without using the caramel bits, would be to use toffee bits, as those would be more crunchy than sticky and overall a bit easier to eat.